Allergy Advice: Contains Nut, Barley, Oat, Wheat, Soy. Storage Conditions: Keep away from direct sunlight and store in a cool dry place. Ingredients: Water (62%), White Sugar (10%), Brown Sugar (6%), Red Bean (5%), Cashew Nut (4%), Barley (0.9%), Buckwheat (0.85%), Rice (3%), Sweet Corn (0.65%), Oat (0.65%), Wheat Kernel (0.65%), White Kidney Bean (0.5%), Mung Bean (0.9%), Soybean (0.9%), Black Rice (3%), Emulsifier (E473), Flavouring. 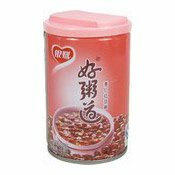 Simply enter your details below and we will send you an e-mail when “Job's Tear & Red Bean Mixed Soup (銀鹭好粥道薏仁紅豆粥)” is back in stock!